Have I ever revealed how much I love snickerdoodles? Even if I have, I apologize, but let me rant again. Snickerdoodles are, by far, one of the best cookies ever. And I am positively perplexed and appalled when some weirdos confess they have never, ever had snickerdoodle cookies before. Really? That’s like saying that peanut butter cookies are exotic. They aren’t, and snickerdoodles are like, a must-chew cookie. Seriously. They’re about as important as chocolate chip cookies, except tastier, because they’re sugar cookies rolled in cinnamon and more sugar. More sugar = more better. You know. When I used to work at a frozen yogurt shop, we got snickerdoodle froyo. It was like a dream come true… until I tasted it. Yeah, it had a similar flavor, but nothing compared to the real thing. Kinda devastating? You bet. And when I tried snickerdoodle ice cream, I kind of flipped my shiiiiet. But when I realized it was like a super milky version of the cookie, I wasn’t wowed. Instead, I was bummed and had a horrible stomachache, but I won’t go into graphic details. Yeah, I know, I know. If you have a good thing, don’t mess with it. But I can’t not mess with snickerdoodles. They’re far too tasty to stay as a cookie forever. Their flavor must be reincarnated to another level of awesomeness, so what better way than to transform this classic cookie into a cupcake? You had to see that coming, people. So I did. And guess what? This is something I’m finally pleased with. 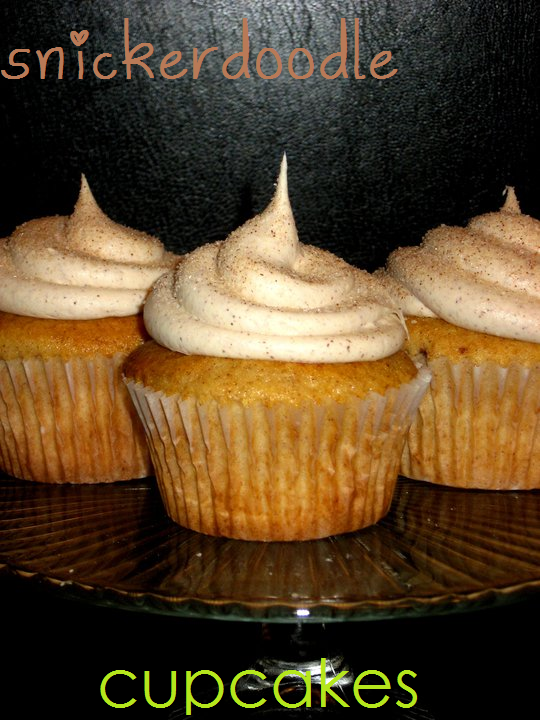 If snickerdoodle cookies mated with cupcakes, this would be their delicious offspring. No disappointments, just yummy cinnamon-sugary goodness. And cinnamon cream cheese frosting. ‘Nuff said, that stuff is legit. I got the SUPER easy snickerdoodle cupcake recipe from the lovely Amy Clark at The Motherload, but I’ll give it to you just to be nice. Thanks, Amy! 1. Preheat oven to 350 degrees F. Line 2 muffin pans with paper liners. In a large bowl, beat together cake mix, butter, milk, eggs, vanilla and two teaspoons of the cinnamon until well blended. Evenly divide batter into muffin cups and bake approximately 22-25 minutes or until a toothpick inserted in the center comes out clean. Cool completely. 2. Meanwhile, spoon canned frosting into a medium sized bowl and stir in remaining two teaspoons of cinnamon until well-combined. Frost cinnamon cream cheese frosting onto cooled cupcakes (I used Atecco tip #807) and dust with remaining cinnamon sugar, if desired. I don’t drink coffee, but I’d imagine these sweet and spicy cakes would be lovely with a cup. Just sayin’. And even if you don’t drink coffee… they are absolutely lovely on their own and are like, snickerdoodle cookies sinful, cuter twin. Duh.